We have a great number of volunteer positions at Momiji, below is a sample of the volunteer positions most frequently needed. To find out more about these and other volunteer opportunities contact Momiji’s Manager of Volunteer Services at 416.261.6683 x 234 or email volunteer@momiji.on.ca. Driver Use your own vehicle to take seniors to medical appointments or other community engagements. You will be reimbursed for mileage. Receptionist Answer phones, greet visitors and help our staff with administrative tasks for a half or full day per week during regular office hours. Friendly Visitor Visit isolated seniors throughout the community and provide companionship and social support. Visitors are matched with clients by common interests, language and location. 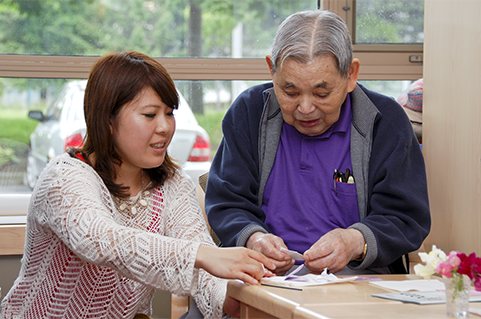 Program Assistant Assist in a wide variety of regular programs and activities for seniors at the Momiji Centre. Support our staff on outings, help seniors to participate in activities or help serve meals. 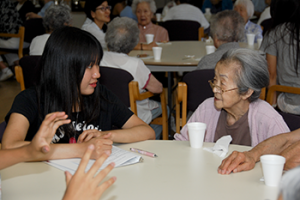 Cultural Outreach Help provide culturally appropriate and enriching programs, meals and special events for frail Japanese Canadian seniors at our partner long-term care facilities across the GTA. Momiji Bazaar and other Special Events Develop your event-planning, hospitality and entertainment skills at a variety of special events throughout the year.